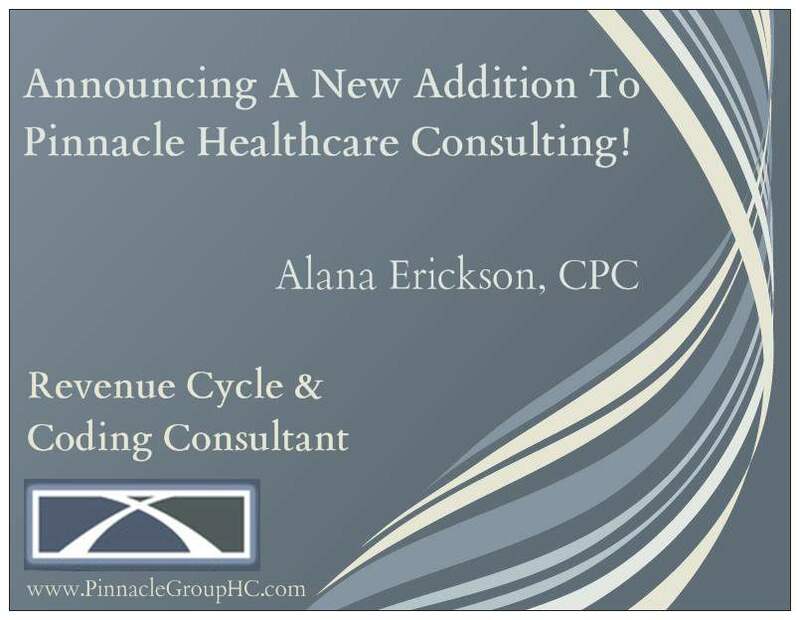 The Pinnacle Group is excited to extend a warm welcome to Ms. Alana Erickson, a recent addition to the Pinnacle Healthcare Consulting team as a Revenue Cycle & Coding Consultant. Alana Erickson serves as a practice management and coding consultant with Pinnacle Healthcare Consulting, which continues to add depth and value to revenue cycle reviews. She brings over 21 years of experience in various healthcare management positions to assist hospitals, physician practices and other provider organizations with performance improvement needs. Alana’s expertise spans the spectrum of healthcare delivery in metropolitan, rural, hospital and physician practice settings. She offers a wealth and variety of knowledge in practice management and operations as well as revenue cycle management services including compliance, physician practice audits, physician billing guidelines, practice management, and electronic health record (EHR) systems analysis/implementations. Alana’s professional background includes director roles, where she was responsible for physician relationships, information technology and business support for critical access hospitals and rural health clinics. Past roles also include service as liaison or consultant for specialty groups in health system EHR implementation projects. She served as a practice administrator for a medium sized cardiology and cardiovascular surgical group, where she managed strategic planning, daily operations, third-party contracting, system implementations, financial management, benefits administration, and management of staff and key relationships. Most notably, Alana’s experience boasts management of all business operations for a multi-specialty group of 80+ physicians. With Alana’s array of capabilities, she has assisted in providing strategic and operational management, physician recruitment, rollout of practice management and EHR systems, human resources and a variety of key services necessary for integration. Upcoming Events: Have an event that we should attend? Please let us know! Click twice to enlarge image and read full text. Mr. Johnson offers a wide range of healthcare experience to the Pinnacle Group that includes nearly 30 years of executive leadership. His areas of expertise include strategic healthcare initiatives with health systems and physician practices. Bill’s professional experiences include strategic planning, business development, physician recruiting, operational management of large physician practices in multiple locations, outreach development, financial operations, business/practice mergers and acquisitions, physician/hospital joint ventures, selection of practice management and electronic health systems for practices. He has additional experience in third-party contracting, physician integration strategies, physician compensation models and tax planning for strategic decisions. Within Pinnacle, Bill provides financial and strategic direction as well as consulting on client engagements. In his free time, Bill enjoys the serenity of fly-fishing in Colorado’s rivers and streams. He additionally enjoys other forms of outdoor recreation such as playing tennis and mountain biking. However, don’t peg him as your standard Colorado resident. His interests are as varied as they are unique. Just ask him about his interest in amateur radio! In the employment model, discussed in the FMV Compensation Perspective, a hospital might be in a position to purchase a physician or group practice as part of its integration strategy. The process of determining future physician compensation, coupled with what price to pay for an existing medical practice, is a tricky one. Future physician compensation is often based largely on the historical performance of the individual physicians. Since historical compensation for physicians in a private practice is essentially collections from the delivery of professional services less the expenses of running the practice, profits after physician compensation are negligible. As a result, traditional going concern value, where an investor expects to earn a return over and above the costs to operate the business, does not exist. Under these specific circumstances, the value of a physician medical practice boils down to the cost of reproducing the assets necessary to run the practice. In valuation parlance, this entails the application of the cost, or asset-based approach to value. While identification of the items a physician practice needs to operate is the first step, placing value on each component is the second phase that requires due diligence. Involving the physician or physicians from the early stages, communicating frequently throughout the process and keeping the process transparent will make for a smooth valuation process. Ask the question, “What is required to reproduce the medical practice from scratch?” The first meeting will involve identifying all tangible and identifiable intangible assets of the practice. Tangible assets generally include medical equipment and instrumentation, furniture and fixtures, such as exam tables and waiting room furniture, office equipment, and computer equipment such as hardware and software, etc. In addition, the practice may also own the real estate in which it operates, or if it leases the space, may have made investments in leasehold improvements that are of value to both buyer and seller for future operations. Other tangible assets include inventories of medical supplies and drugs. Accounts receivable are another tangible asset owned by a medical practice; however, they are not typically included as part of the transaction and the physicians are responsible for the collection of the receivables outstanding prior to the deal’s closing. As part of the valuation process, it is advisable to include the physicians or practice administrator in the process early on to set expectations for how the practice will be valued, timing of major milestones such as meetings, and delivery of the valuation results. Hopefully the above tips have assisted in gaining perspective in terms of proper identification during business valuations. Click image twice to enlarge and read full text. As healthcare providers continue to prepare and position for healthcare reform, the common challenges associated with physician integration is unchanged. A successful relationship depends on setting clear expectations, effective operations management and aligning compensation to performance. On the surface, physician integration is a win-win situation for a hospital and physician. The hospital is able to bolster its team of physicians, which improves its patient care delivery system. The physician no longer has to directly deal with health plans, large capital expenditures and running a small business. Unfortunately, a scenario all too common to hospitals – after hiring the hard-working, independent physician and providing a salary, the physician’s work ethic notably slows down. Consequences may include a decrease in patients due to diminished access or a physician’s disenchantment with peers and management. All the while, the individual physician may not understand what is taking place and suddenly finds him /herself in a less revered way. When demands of an independent practice are absent, many physicians do not feel the urgency to produce for someone else, as they did for themselves. To avoid this scenario, hospitals must be candid about their expectations and evaluate prospective physician employees accordingly. Compensation programs must be devised to either reward work efforts or help physician(s) ease out of practice. If a physician cuts his productivity, call availability, and other contributions by half, the related compensation must be commensurate and be discounted by the same amount. Many hospitals question, What is the best method for paying employed physicians? The answer – there is no best “one-size-fits-all” method. The best way for an organization to pay its employed physicians depends on the unique dynamics of the specific organization. Every organization will have unique characteristics (e.g., specialty compositions, mission requirements, payer / patient factors, persistent or unresolved problems, cultural traits, etc.) that will influence what the organization needs to achieve through its physician compensation plan. These characteristics will define objectives that should be incorporated into compensation programs. There are different types of compensation models and templates that can be evaluated to help hospitals structure their compensation programs. Before looking at these models, the objective of the compensation program MUST be defined. Importantly, when designing incentives to promote specific objectives, the risk / reward must be significant enough to directly affect physician behavior. In contrast to the past, hospitals felt compelled to “own” physicians. However, the attitude today is one of partnership and shared risk / reward. Many hospitals are willing to commit the resources to provide physicians the opportunity to maintain historic income levels, but expectations are set so that commensurate value is received in return. One of the most common compensation frameworks that hospitals now adopt is one that centers on rewarding productivity and other forms of performance. In other words, hospitals are trying to align hospital objectives of efficiency and fiscal responsibility with physician objectives of income and stability. Common productivity models will establish base compensation levels and pay incentives to physicians as they exceed Work Relative Value Unit (WRVU) thresholds or some other measure of output (e.g., charges). Depending on the market and payer conditions, these models may or may not directly incorporate practice profitability as a variable in the compensation formula. 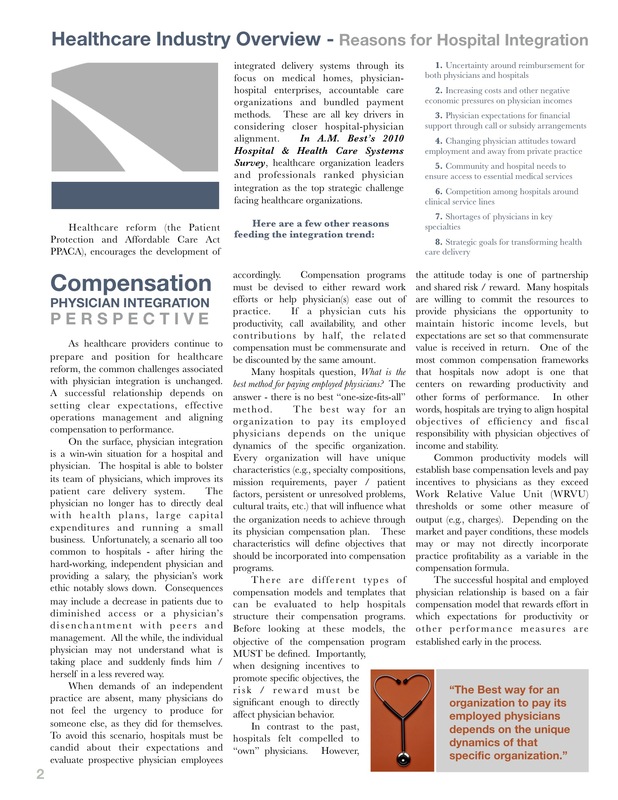 The successful hospital and employed physician relationship is based on a fair compensation model that rewards effort in which expectations for productivity or other performance measures are established early in the process. 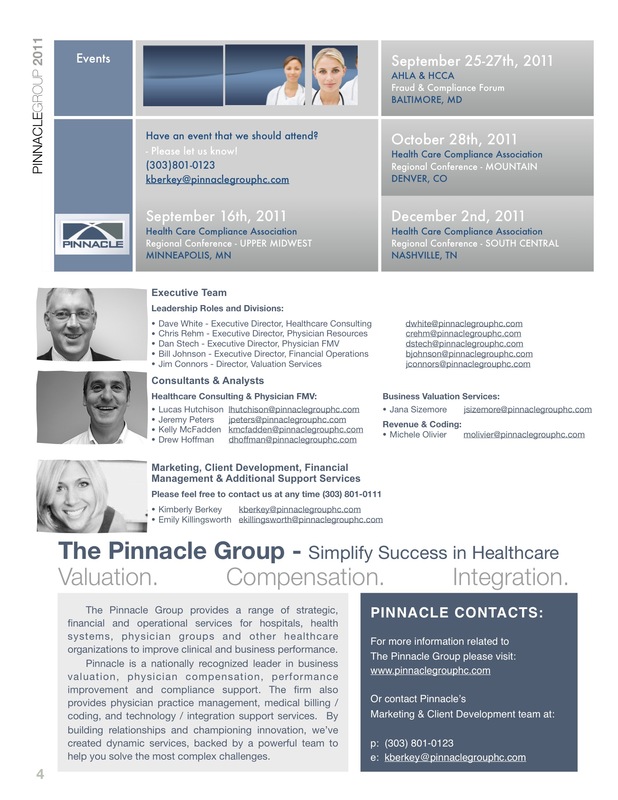 Pinnacle Perspective Newsletter – Valuation. Compensation. Integration. Welcome to our Pinnacle Perspective Newsletter! For your desired article of interest, please click on link directly. Thank you and enjoy! 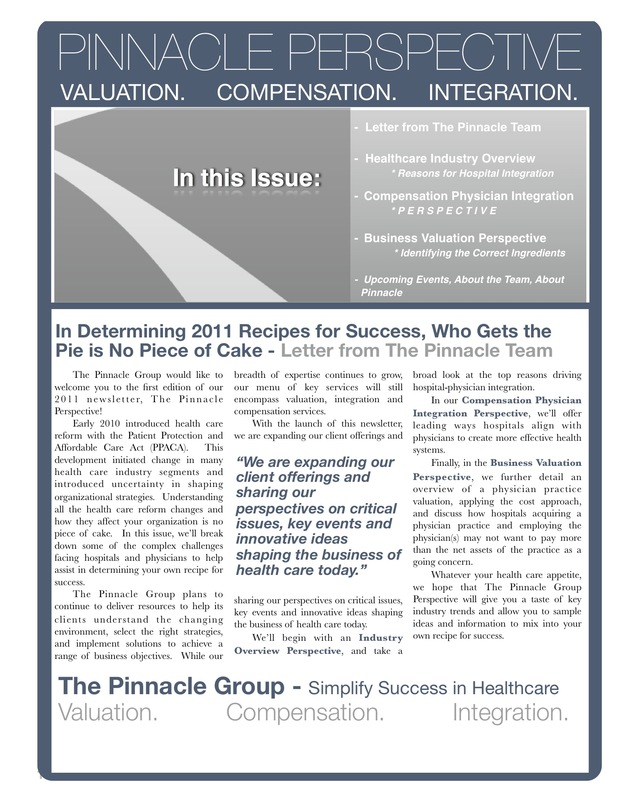 The Pinnacle Group would like to welcome you to the first edition of our 2011 newsletter, The Pinnacle Perspective! Early 2010 introduced health care reform with the Patient Protection and Affordable Care Act (PPACA). This development initiated change in many health care industry segments and introduced uncertainty in shaping organizational strategies. Understanding all the health care reform changes and how they affect your organization is no piece of cake. In this issue, we’ll break down some of the complex challenges facing hospitals and physicians to help assist in determining your own recipe for success. The Pinnacle Group plans to continue to deliver resources to help its clients understand the changing environment, select the right strategies, and implement solutions to achieve a range of business objectives. While our breadth of expertise continues to grow, our menu of key services will still encompass valuation, integration and compensation services. With the launch of this newsletter, we are expanding our client offerings and sharing our perspectives on critical issues, key events and innovative ideas shaping the business of health care today. We’ll begin with an Industry Overview Perspective, and take a broad look at the top reasons driving hospital-physician integration. In our Compensation Physician Integration Perspective, we’ll offer leading ways hospitals align with physicians to create more effective health systems. 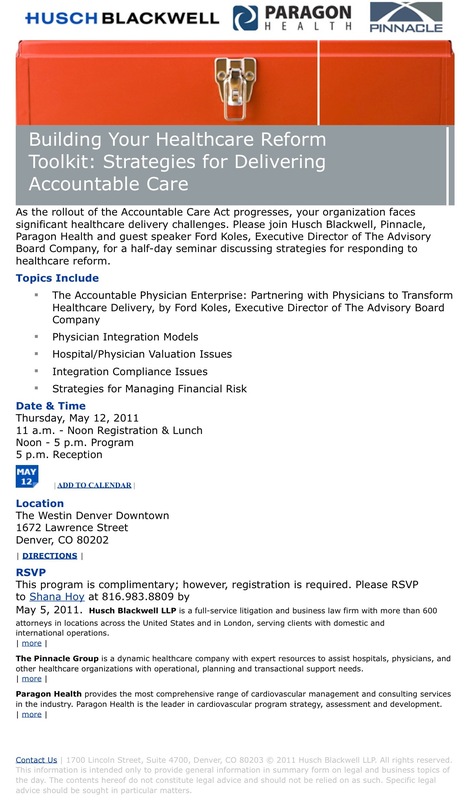 Finally, in the Business Valuation Perspective, we further detail an overview of a physician practice valuation, applying the cost approach, and discuss how hospitals acquiring a physician practice and employing the physician(s) may not want to pay more than the net assets of the practice as a going concern. Whatever your health care appetite, we hope that The Pinnacle Perspective will give you a taste of key industry trends and allow you to sample ideas and information to mix into your own recipe for success. Click twice on each image to enlarge and read full text. Healthcare reform (the Patient Protection and Affordable Care Act PPACA), encourages the development of integrated delivery systems through its focus on medical homes, physician-hospital enterprises, accountable care organizations and bundled payment methods. These are all key drivers in considering closer hospital-physician alignment. In A.M. Best’s 2010 Hospital & Health Care Systems Survey, healthcare organization leaders and professionals ranked physician integration as the top strategic challenge facing healthcare organizations. The Pinnacle Group is a dynamic healthcare company with expert resources to assist hospitals, physicians, and other healthcare organizations with operational, planning and transactional support needs.| more |Husch Blackwell LLP is a full-service litigation and business law firm with more than 600 attorneys in locations across the United States and in London, serving clients with domestic and international operations. Paragon Health provides the most comprehensive range of cardiovascular management and consulting services in the industry. Paragon Health is the leader in cardiovascular program strategy, assessment and development. or follow http://healthaffairs.org/blog/2010/12/20/productivity-still-drives-compensation-in-high-performing-group-practices/ to the HealthAffairs Blog. In July, 2009, President Obama visited the Cleveland Clinic and praised its ability to provide hospital care less expensively than some other famous hospitals. This claim was bolstered by a recent study  demonstrating that large multispecialty practices have lower cost and higher quality in treating Medicare recipients compared to other practitioners in their regions. One of the hypotheses for this result  is that physicians in such practices are paid by salary rather than on the basis of how much revenue they generate. This claim prompted us to discover which forms of compensation are typical for multispecialty group practices and how such compensation might be linked to medical cost expenditures. We contacted leaders at 12 multispecialty group practices—eleven of whom participated in the Medicare study cited previously . Ten of the twelve group practices pay physicians on the number and type of clinical services they provide with total compensation competitive with private practice. We conclude that cost savings demonstrated by group practices do not appear to be related to a fixed form of compensation. The twelve practices we surveyed were the Billings Clinic; the Cleveland Clinic; the Geisinger Clinic; the Guthrie Clinic; the Henry Ford Medical Group; the Intermountain Medical Group; Kaiser Permanente of Northern California; the Lahey Clinic; the Marshfield Clinic; the Mayo Clinic; the Ochsner Clinic; and the Virginia Mason Clinic. (Short descriptions of each practice are included in an appendix at the end of this post.) The twelve practices were arbitrarily chosen because of their large size and scale, their longstanding experience and success in health care delivery, and their geographic diversity. While several of these clinics have research and education enterprises, none is a medical school faculty practice plan. Most of the groups give financial credit for time spent on research, teaching, and administration, and some consider patient satisfaction in determining part of the compensation. (1) None of the practices compensate on the basis of the number of consultations or tests the physicians order. Doctors in each of the multispecialty group practices studied do not realize income from facility fees since it is the practice or the hospital, not the physicians, who own the equipment and charge for their use. Most of the respondents told us that they pay salaries that are equal to, nearly equal to, or greater than the amount the doctors could earn in private practice in their regions. Furthermore, many of the groups provide benefit programs and support structures that often exceed those available in many practices. Consequently, when one includes all the costs of employing physicians in large, multispecialty group practices, the total for most physicians is probably not significantly less than the amount they could earn practicing privately. 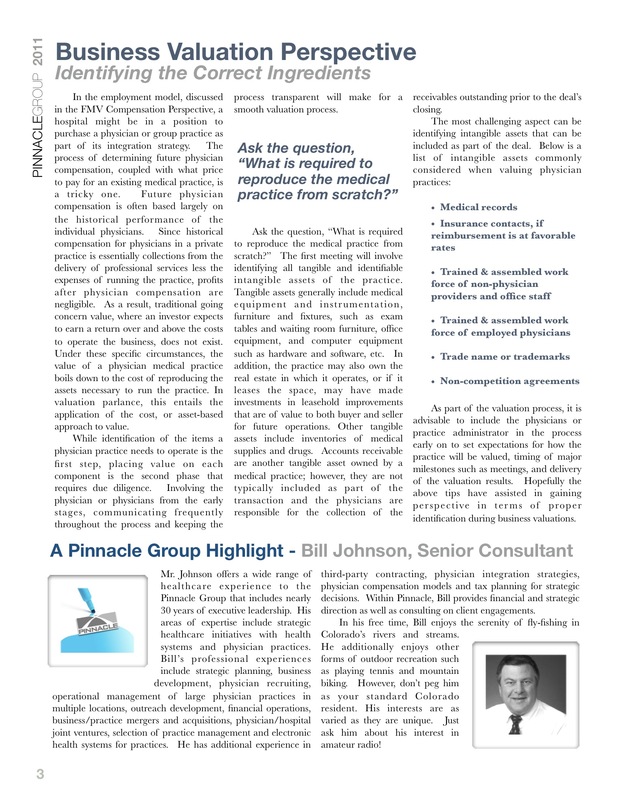 Volume is a significant factor in determining compensation in many multispecialty group practices. As more physicians seek the advantages of working at large multispecialty group practices  over remaining in, or joining, individual or small group practices, the question arises whether physician compensation in such large groups is uniquely different from compensation in other forms of practice. As best we can tell , in the absence of much literature directly dealing with the subject, the answer is “no.” Only two of the 12 large multispecialty group practices that we studied—Kaiser Permanente of Northern California and Mayo Clinic—pay their physicians with fixed salaries in which income does not depend on clinical productivity. From these observations, it appears that many, if not most, large multispecialty group practices take volume into consideration in compensating their physicians. Though these large groups may provide higher quality at lower cost—as some studies  assert  – their compensation programs do not appear to differentiate most of them from other group or private practices. Our study did not examine distinguishing features such as practice culture, governance, insurance contracting, and payment for performance. Any combination of these factors  can motivate practices to improve quality and reduce cost. (15,16) It does not appear, however, from our data, that the method of compensating physicians, many of whom can increase their incomes by generating more business for the group, directly contributes significantly to these savings. More comprehensive data from further, more detailed studies are required to prove whether this thesis is correct. In joining a group, doctors give up charging for use of equipment that they or their groups may own. Of course, the doctors must spend or borrow capital funds to buy or lease the equipment if they want to collect facility fees for their use. Nevertheless, the return on these investments can be quite sizeable for some specialties. In private practice, physicians, either individually or in specialty groups, who own such equipment have a strong financial incentive to use it more. (17) This incentive does not apply to physician compensation in any of the groups that we studied where the groups or the hospitals own the equipment and collect the facility fees. Our study has implications for health reform. Most organized group practices, known for lower cost and higher quality, reward physician productivity. Some health reform proposals, like capitation and bundled payments, will change revenue flow and may disrupt the conventional RVU metrics. For example, physicians may be asked to perform “non-RVU” work, like coordination of care. Health policy makers should be aware that even among practices cited as exemplary, physician procutivity is embedded deeply in the current system of rewards. In conclusion, our study reports that, in the 12 groups we studied, salary without supplements or consideration for volume is the exception rather than the rule. We also learned that, driven by competition to recruit doctors, most of our multispecialty group practices compensate at levels that approximate or nearly approximate what the physicians could earn in private practice. Even GOOD intentions can go BAD or get UGLY. 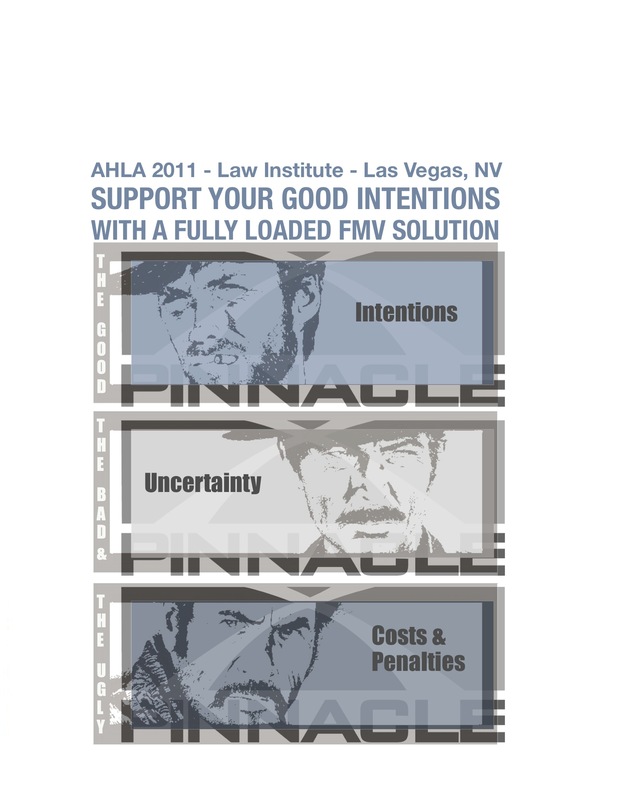 Visit The Pinnacle Group for a fully loaded solution, February 9th – 11th, at the upcoming AHLA 2011 Law Institute in Las Vegas, NV. Physician FMV dramatically reduces the complexity of determining physician fair market value. The Program helps build internal capacity and provides more control over the contracting process with powerful information and proprietary tools to help you make defensible decisions about physician relationships. Stop gambling with compliance. Take away uncertainty with a fully loaded solution. We look forward to meeting your in Vegas! 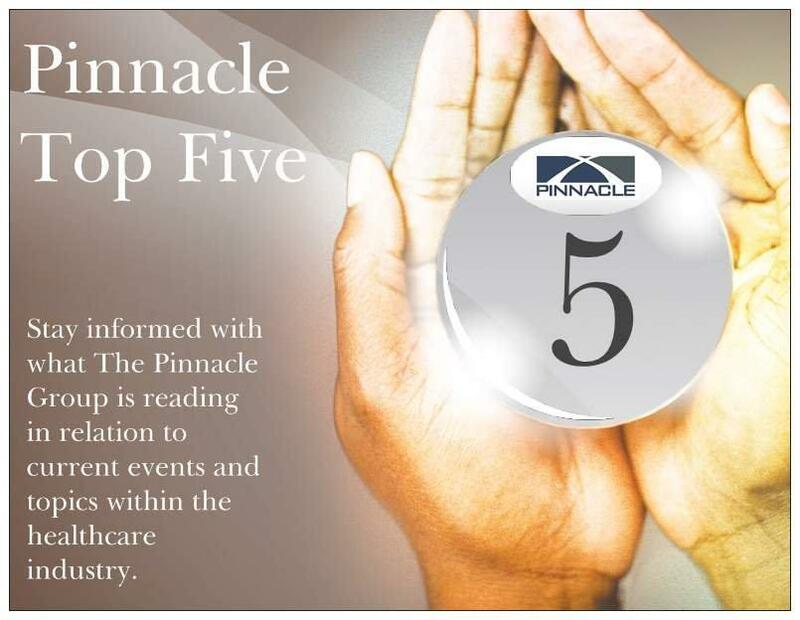 The Pinnacle Group is a nationally recognized leader in valuation services, physician compensation, revenue cycle & coding consulting, and hospital-physician integration. Pinnacle supports a wide variety of clients including, but not limited to: hospitals and health systems, ambulatory surgery centers, physician groups, dialysis providers, medical device and other healthcare companies. Sister companies to Pinnacle provide services related to physician practice management, medical billing and coding, and technology/integration support services, which affords Pinnacle operational perspectives and insights – not typically available through other consulting firms. Pinnacle’s services are backed by a professional and responsive team, to help our clients devise solutions to their complex and challenging issues.